This round-up is the special David Sedaris issue: I wrote about his new book Calypso, and then I interviewed him! It was particularly exciting for me since I've been a fan for over a decade (and first reviewed his 2013 book here, as well as his 2017 book here.). Enjoy! 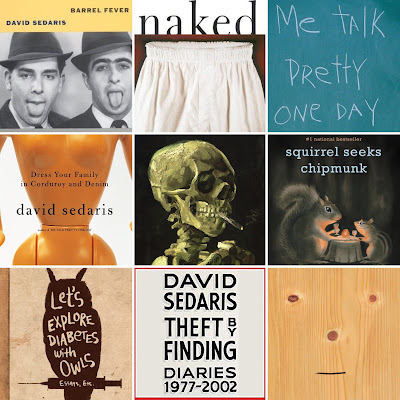 "Getting Lost in Thought with David Sedaris," PopMatters, June 5, 2018. "Calypso paradoxically uses this wandering, almost distracted-seeming style of storytelling within the overall themes of the book to conjure a sense of Sedaris traveling through his own thoughts, getting lost on particular charming tangents about his siblings before coming back to what he ultimately wants you to take away. The first essay in Calypso, "Company Man", is framed around Sedaris' naked enjoyment of being well-off enough to have multiple guest rooms in his homes. Yet as the essay continues, Sedaris merely uses that sense of success and satisfaction as a pretense for an overall aura of loss, setting the tone for the rest of the book. It's an acknowledgement that even though he can buy anything he wants, and provide for everyone he loves, there are things and people that are lost and gone. After all, who's going to stay in his multiple guest rooms if not his sisters, brother, father, and other loved ones? "After you place "Now We Are Five" into shattering context as the second of more than two dozen essays in Calypso, even the more amusing tales of shopping for artfully destroyed clothing and dealing with gastrointestinal viruses exude a somber sort of introspection. Stories that appear to follow patterns established in previous books soon take a turn for the meditative. In "Untamed", Sedaris becomes emotionally invested in a wild fox prowling around in West Sussex, until she disappears. The story ends with Sedaris looking out over his yard, calling for a companion who will never return—a companion who only ever saw him as a repository of delicious meats. In stories like "April in Paris" (When You Are Engulfed in Flames, 2008), Sedaris' fixation with befriending wild animals (in this case a spider) comes across as charming if eccentric, but as befits the tone of Calypso, "Untamed" asks whether the gesture was anything more than futile in the first place." "So, Why Does Anyone Like David ​Sedaris?" PopMatters, June 7, 2018. "Q: So I've read all of your books, and I've noticed as I've read some of your later books that your writing style has changed. The way you enter a story and the way you decide to frame it has changed. In Calypso, I noticed that with the story about the Fitbit ["Stepping Out"] it goes in one direction, where you're talking about the woman you met, and then it goes into [your adventures with] FitBit. Or with ["The Perfect Fit"], you think it's going be about your relationships with your sisters, and then it's about shopping, with the relationship in the background informing it, right? "There's an essay ["Day In, Day Out," Let's Explore Diabetes With Owls] where you talk about about your writing habits, but I was wondering if you could expand on how you feel your writing has changed from your first book to now. "A: I was a fiction writer. And I just wrote fiction. And then "Santaland Diaries" [Barrel Fever and Other Stories, 1994] was on the radio, and then "Morning Edition" [NPR] said they wanted to have me back, but it had to be nonfiction. And so I kind of accidentally ended up writing about my life. I knew I wasn't a journalist; I knew I didn't want to go out into the world and act like a reporter. Nothing about that appeals to me. But I think when I started, Ira [Glass] started doing "This American Life" and he'd say, "our theme this week is going to be music lessons," so then I'd write an essay about that. But I feel like back then— you know, if you're in school and you write an essay, you're taught to have a topic sentence, and Ira wants the story to be under way within two paragraphs. "But I think I evolved away from that, so now I'm like, "I'm gonna talk about this for a while, and I'm gonna talk about this for a while." One of the things I like about The Simpsons is that if you watch most sitcoms, you think, "oh, someone's going to get their finger stuck in a bowling ball, or someone's high school boyfriend is going to run into them and they're going to get back together." But if you watch the first few minutes of The Simpsons, I defy you to know what the episode's gonna be about. And I really like that about it. So I would rather be that way."